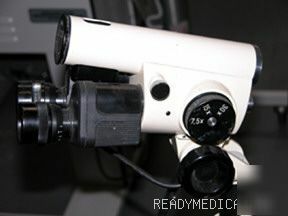 Model 1-D - 3 magnification 7.5X, 15X, 30X. Rheostatically incandescent illuminated. Sold with cleaned optics, function checked and electrically certified. We are LICENSED medical equipment dealers with 40,000 sq ft of warehouse space, and 21 years experience. All items under warranty cover parts and labor only, contact seller immediately if there is any damage or problems with order! !